A4 Glossy Picture Paper - Kodak glossy picture paper for inkjet prints. Works with all inkjet printers including HP, Epson, Canon, Lexmark, Dell. A4 Premium Ultra Glossy Picture Paper - Kodak premium ultra glossy picture paper for inkjet prints. Works with all inkjet printers including HP, Epson, Canon, Lexmark, Dell. 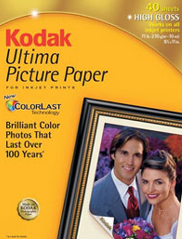 A4 Ultima Ultra Glossy Picture Paper - Kodak ultima ultra glossy picture paper for inkjet prints. Works with all inkjet printers including HP, Epson, Canon, Lexmark, Dell.